Thermotech Digital Moist Heating Pads are the first medical grade electric moist heating pad available to the public.. Thermotech digital moist heating pads, as opposed to dry forms of heat, draws moisture from the air and retains it in specially designed high-grade ceramic heating element cells and delivers that moist heat deep into your muscle tissue for maximum relief similar to a deep tissue or shiatsu massage. The pad is constructed from double stiched 100% premium grade durable corduroy with a soft plush flannel cover for ultimate durability and comfort. Moist heat increases circulation and speeds recovery by bringing in fresh blood cells and taking away the wastes which may hinder healing. Rest and the Thermotech Hot Pack will gradually relax the muscle spasm, restoring its normal length and relieving pain. No water is needed. The Thermotech Digital Heating Pad produces moist heat automatically by drawing moisture from humidity in the air and retaining it in the hot pack's outer flannel cover. Because it delivers very intense moist heat, the Thermotech is more effective than other electric heating pads on the market. The application of moist heat (fomentation) is commonly prescribe by physical therapists chiropractors and doctors. The Thermotech medical grade digital heating pad is the choice of professionalsis the method that is most often recommend. 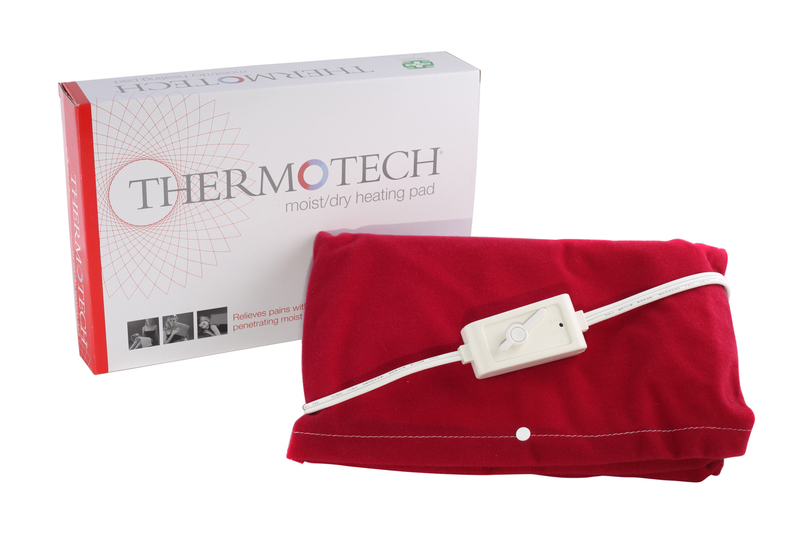 Thermotech is the premiere patient friendly moist heating pad. The Thermotech heating pad produces moist heat through a sponge added insert. This moisture is then retained by the pads outer flannel cover. The flannel cover is washable, and included at no extra charge. Moist heat increases circulation, and speeds recovery, by bringing in fresh blood cells. The application of moist heat has been proven useful in relieving many types of pain, including arthritic and rheumatic pain. Due to the fact that this product was recently re-designed to feature infrared heat, infrared technology is not explicitly mentioned on the product packaging nor within the user manual for this product. We are working on re-designing the packaging and user manual to reflect the presence of infrared heat. Instructions for use of this product remain the same. Please keep this in mind when you receive your shipment!